HSBC shares are being weighed down by fear of the future. The global lender thinks it can boost returns even as its balance sheet shrinks. That’s why it hiked the dividend despite a 7 percent drop in underlying pre-tax profit in 2015. But investors remain more worried about negative interest rates, China’s slowdown and cheap oil. Fresh from its decision to keep its head office in London, Europe’s largest lender might have hoped full-year results would offer frazzled shareholders further reassurance. A precautionary $500 million provision for possible bad loans to the energy industry dented earnings. However, half of its $29 billion exposure to the oil and gas industry is to state-owned companies, with major integrated groups accounting for a further 18 percent of the total. Despite concerns about the People’s Republic, bad debt provisions in Asia were up a fairly modest 7 percent. And though central banks’ negative interest rate policies have the potential to squeeze bank earnings, HSBC is not yet feeling much additional pain: its net interest margin in the fourth quarter was only three basis points narrower than in the same period of 2014. True, paying out 51 cents a share to investors when full-year earnings came in at just 65 cents per share looks aggressive. But this ignores the fact that HSBC is simultaneously shrinking its balance sheet. Risk-weighted assets dropped by a tenth to $1.1 billion in 2015. As a result, the bank’s equity Tier 1 capital ratio rose 80 basis points to 11.9 percent, even after it paid out $10 billion in dividends. Yet investors are unconvinced. 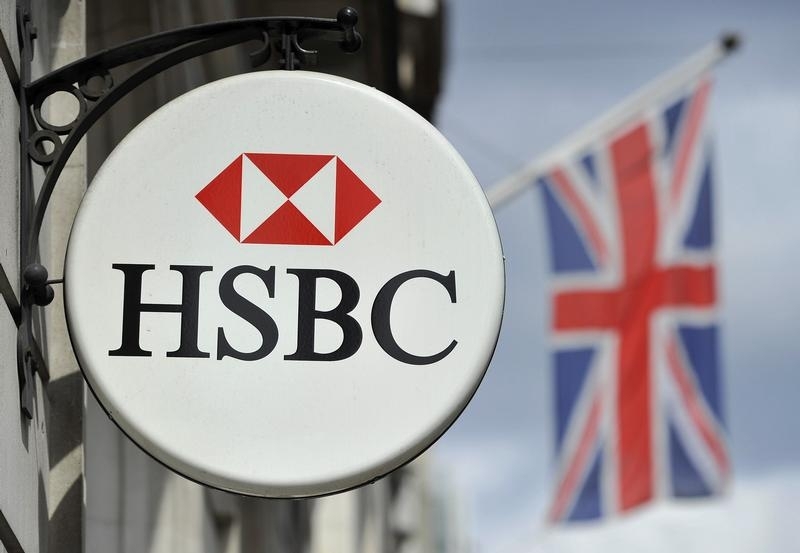 After dropping more than 3 percent on the morning of Feb. 22, HSBC’s London-listed shares now yield a hefty 8.3 percent – a level that clearly signals that shareholders do not believe the payout is sustainable. Of course, any number of concerns could yet throw HSBC off-course: regulators might demand even higher levels of capital; or an economic crisis in China could drag down Hong Kong. HSBC executives have made it clear that they think these worries are more imagined than real. Investors fear the worst is yet to come. They cannot both be right. HSBC’s profit before tax was $18.87 billion for 2015, little changed on the year before and well below analysts’ average estimate of $21.8 billion, according to Thomson Reuters data, dragged down by an unexpected $858 million loss in the fourth quarter. The bank on Feb. 22 also confirmed being among a number of financial institutions under investigation by the U.S. Securities and Exchange Commission (SEC) over recruitment practices in Asia. In a footnote to its earnings statement, it said it couldn’t predict how or when the matter would be resolved but said the impact “could be significant”. The bank said its poor fourth-quarter results reflected value adjustments on derivatives, legal costs and the disposal of its Brazilian business. The figures were also hit by restructuring costs the bank is undertaking to achieve cost savings of between $4.5 billion and $5 billion. HSBC said it would retain Turkish operations that had been up for sale, after offers it received were deemed not to be in the best interest of shareholders. It will instead restructure the unit. HSBC, which just over a week ago decided not to move its headquarters to Hong Kong, said it would raise its total annual dividend to $0.51 per share from $0.50, a relief to investors who had worried the lender’s more constrained capital position would cause it to abandon its goal of dividend growth. In early trading in London, HSBC shares were down 5 percent at 427 pence.